Liliuokalani plays the first organ at Kawaiahao Church, 1867. First Playing of the Organ of Kawaiahao Church. At 10 in the morning of the 25th of December, the great musical instrument of Kawaiahao was played before the great crowd who gathered there to hear it being played for the first time. A great assortment of people came to hear and to see for themselves. The Organ was played by the Princess, the Honorable Mrs. Lilia Kamakaeha Dominis, the royal leader of the Kawaiahao choir, and she was honored by her royal younger sister, Likelike, as well as the Honorable Mrs. Pauahi Bishop, who sat in the choir. After the singing of the hymn, nicely and fearlessly by the royal one who performed it, albeit this was the first time she played the organ before a crowd; then Rev. E. Kekoa stood and explained briefly the fulfilling of the dream of the Kawaiahao Choir, the church members, and the public, who helped with their 25¢ and their 12½¢ so that we could have this Great Instrument which is being played. At the closing of this speech above, the Kahu of Kawaiahao stood and explained to all the birth of the King of kings, and the Lord of lords in the city of David, and expanded on things related to the birth of that Prince of Life. At the conclusion of his speech, a hymn was given, and that alii lept into action, like she was very accustomed to it; and we are greatly appreciative for her advancement in musical instruments; and this was followed by a prayer, and then the congregation was released. The 7 foreign language speaking haole [?] gifted to Rev. H. H. Parker, $100.00 after the end of the prayer. which was [….] by W. Ka, and it was placed on the right hand of that royal one with the words below [….] by A. H[…..]. Two. Your servants, the members of the Kawaiahao Choir, constantly think of your everlasting patience as you face the heavy rains of the winter, the scorching sun of the summer, the pitch dark nights of Town, and the bright moonlit nights, as you lead us in our Hymns. And for these reasons, we ask of you, should your servants have the aloha of our Princess, the Honorable Mrs. Lilia K. Dominis, then let the Army of the wide Heavens watch over you. With aloha. Ka Nupepa Kuokoa, Buke VI, Helu 52, Aoao 3. Dekemaba 28, 1867. 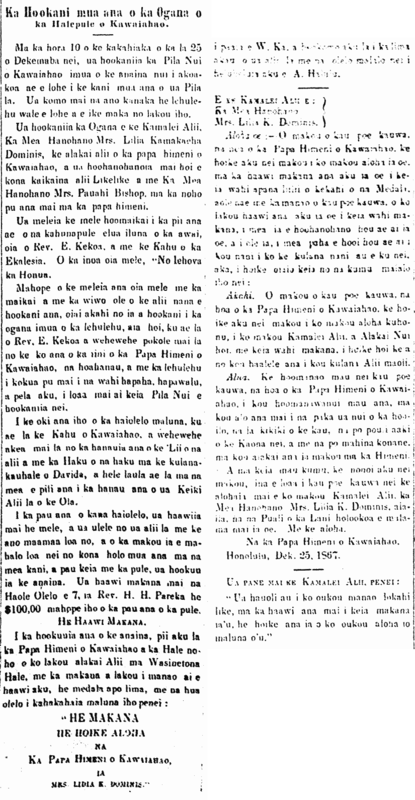 This entry was posted in Alii, Mele, Religion and tagged "No Iehova ka Honua", E. Kekoa, H. H. Pareka, Henry H. Parker, Kawaiahao Choir, Kawaiahao Church, Likelike, Lilia Kamakaeha Dominis, Liliuokalani, Organ, Pauahi Bishop, W. Ka, Washington Place by nupepa. Bookmark the permalink.